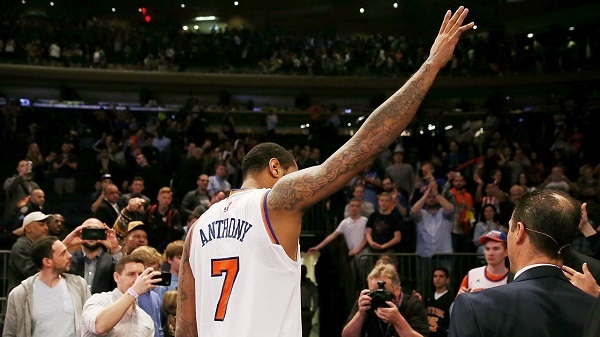 The seven year saga that was Carmelo Anthony as a New York Knick is finally over. While there were some ups, and plenty of downs, the last year or two had been full of trade rumors as a frustrated Carmelo and an organization heading in a different direction lead to a strained union between the two and the writing was on the wall for a divorce. After a summer full of rumors and reports that he was going to Houston, Anthony was dealt to the Oklahoma City Thunder this past weekend for Enes Kanter, Doug McDermott and a 1st round pick. In seven seasons with the Knicks, Carmelo averaged 24.7 points, 7.0 rebounds and 3.2 assists and made six-all star appearances and two All-NBA appearances. He always dreamed of playing for the Knicks as a native that spent part of his upbringing in Red Hook, Brooklyn and by all accounts loved being a Knick and playing in New York City. It is on to a new journey for Anthony and time to see if he can adjust to playing with two other stars and help lead the Thunder deep into the postseason, something he hasn’t experienced since 2013.